The South Fork of the American River is everyone’s favorite California river! Flowing through the heart of Gold Country, it includes rapids which are challenging yet not extreme. There is plenty of time to indulge in family or group bonding, playful joke telling, and spirited water fighting. In-between the rapids, there’s always a little time for a refreshing swim in the cool, clear water. This two-day trip will thrill novice and experienced rafters alike. Enjoy an evening of catered camping at the OARS American River Outpost. Our riverside-camp features hot showers and flush toilets. Bring your own camping gear or rent ours and relax in one of our great campsites. If sleeping on the ground just isn’t your style, you might be interested in our pre-set platform tents, which are fully equipped to make your camping excursion both comfortable and relaxing. 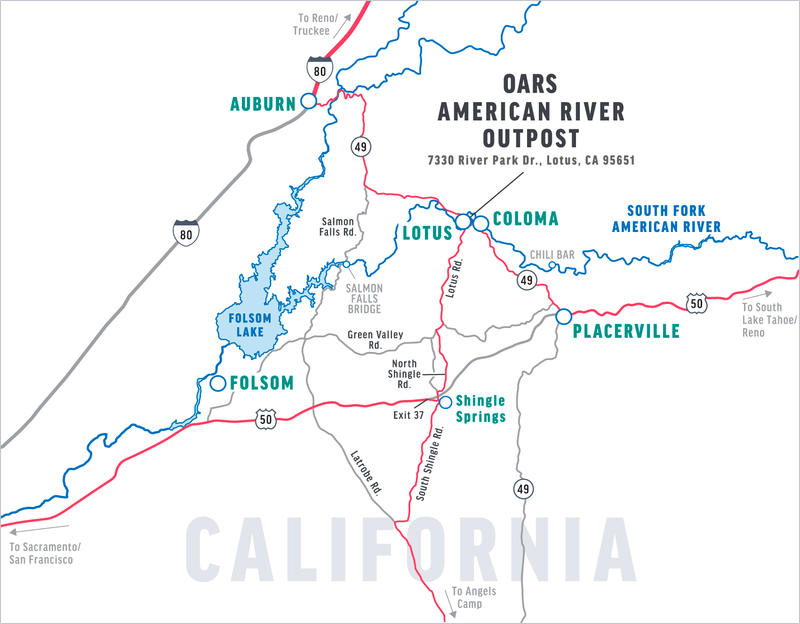 We meet near our camp store at the OARS American River Outpost at 10:30 or 11:00 AM. Roads around here are winding, so please be sure to allow for plenty of travel time. Our river-side campground and base of operations is in the heart of the twin towns of Lotus and Coloma. Our peaceful hideaway is surrounded by plenty of history, recreational opportunities and cultural activities. After you check in with your trip leader, your guides will deliver an orientation and safety talk and fit you with your safety gear. Several miles of Class II rapids allow you to warm up and enjoy and plenty of swimming opportunities before entering the ever-exciting “Gorge” later in the day. Come lunchtime, we will pull over to a beach for a delicious picnic. Your guides will lay out an abundant spread of cold cuts, cheeses, veggies and breads, or perhaps a tasty taco salad for roll-your-own burritos. Lunch is always accompanied by fruit, cookies, cold water and lemonade. There is access to a BLM pit-toilet restroom at our lunch location. After lunch, canyon walls constrict the flow of the river, creating an action-packed series of enjoyable Class III rapids. When we reach our take-out point at the Salmon Falls Bridge, our shuttle vehicles take us back to our campsite where you are welcome to take a swim or a hot shower, join a game of horseshoes, or sit back and relax with a beverage as your guides prepare dinner. Your dinner could be anything from barbecued steak to Dutch oven lasagna. Tasty desserts are always a big hit. The next morning, following a hot breakfast and a 25-minute shuttle ride, you will arrive at Chili Bar put-in for your second day of splashy big-water fun on the South Fork. Enjoy another picnic lunch, relax and go for a dip one last time before arriving back at our campground. Stay with us as long as you’d like before saying goodbye to your guides and our beautiful spot along the South Fork of the American River. 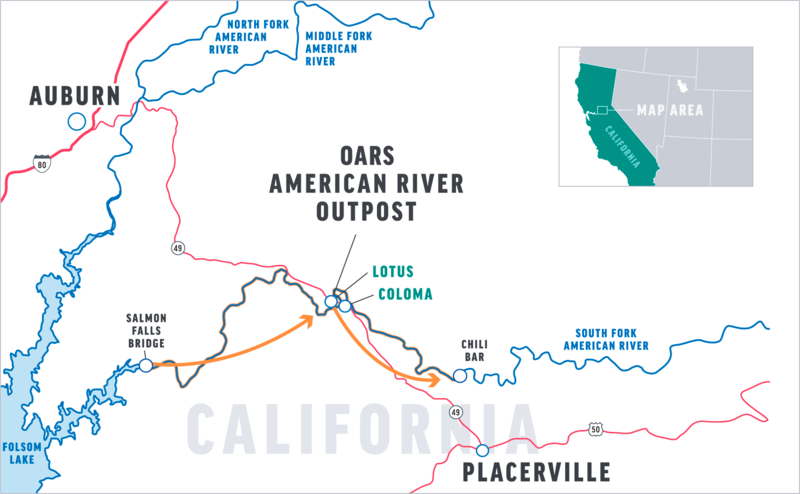 We will meet you near our camp store at 10:30 or 11:00 AM at the OARS American River Outpost, located at 7330 River Park Drive, behind Hotshot Imaging’s store in Lotus. Click here for a Google Map. From Sacramento on U.S. Hwy 50: Follow Hwy 50 east toward Placerville and South Lake Tahoe. Take the Ponderosa Road exit (Exit #37), turn left onto Ponderosa/S. Shingle Road and cross over the freeway. At the second stop light, take the right turn on N. Shingle Road toward Coloma/Lotus. After about 4.5 miles N. Shingle Road turns into Lotus Road—continue going straight for about 6 more miles. As you approach Lotus, pass through the town’s first stop sign and continue to the 3-way stop sign intersection with Hwy 49. Turn left onto Hwy 49 (north) and cross the bridge over the South Fork of the American. Immediately after crossing the river, you will see the “River Park” shopping center on the left, with signs for Hotshot Imaging. Please use the center’s second entrance, where a left-turn lane is provided at River Park Drive. Look to the back of the center, where you will see the entrance to our American River Outpost.